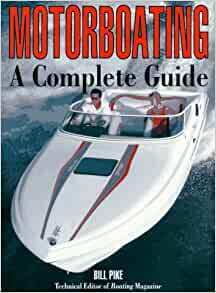 Well written and beautifuly illustrated with breathtaking photographs, Captain Pike's thesis on motorboating teaches and entertains through every page. Enlightening and education and uproariously funny at times, the writing is understandable for master yachsment and landlubbers alike and there are enough pictures to delight even the youngest readers. You will learn the basics of boating. What makes them float to the more technical aspect of cruising. This book also makes a good reference guid or teaching resource for boating safety skills. With sections on how to price and buy a boat, where to buy and when, how they and their systems work and explanations of many of the sometimes mysterious terms of the sea, this book will educate and amuse. Captain Pike brings decades of seafaring to the reader in a narrative that elicit smiles and laughs along the way. A consummate skipper and wonderful storyteller, he keeps the reader interested with personal anecdotes and easy to understand explanations. Before you even consider buyng a boat, give this book a close read. Whether you intend to boat on the open seas or inland waters a few feet deep, you will be very glad you did.